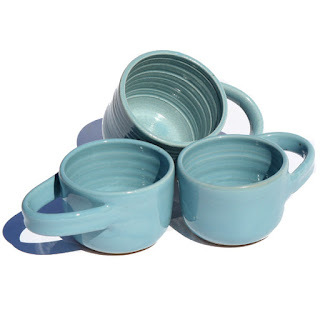 Handmade Artisan Light Turquoise Blue Shaving Mug is made right here in Palm Springs. Each mug is approximately 2.5” tall, 3.25” wide at the top and will easily accept a 3” shaving soap puck. There are ridges on the inside to build up an easier lather with a shaving brush. Each shaving mug is one of a kind. The handle is unique. It is made to accommodate a shaving brush. You can let the brush dry out upside down. Shaving mugs are made in small batches. Buy one for yourself or get one as a gift for a wet shaver.